As I've said before, FX sent episodes 1, 2 and 4 out for review while last week's "Fixer" was held due to post-production issues. So since I loved the pilot (which had the Elmore Leonard story to borrow from) and didn't love the second episode, "Long in the Tooth" served as a kind of tie-breaker, and the episode that convinced me that Graham Yost and company can make an Elmore Leonard show even without specific Elmore Leonard source material to lean on. "Long in the Tooth" had that nice mastery of tones that typifies Leonard (and his literary descendants), with the ability to mix both comic violence like Rolly repossessing the d-bag's fillings with much darker violence like Rolly and Mindy with the coyote, and to mix self-aware pop culture discussion like the hitmen debating "Pulp Fiction"(*) with more iconic uses of pop culture imagery like Raylan's Wild West gunfight with the two hitmen on a lonely desert road. (*) The reference to the scene where Vincent Vega accidentally shoots Marvin in the face was an amusingly reflexive moment. Leonard characters often talk about pop culture (in part because it gives Leonard an excuse to say what characters look like without using the kind of descriptive language he hates), and that's one of the traits huge Leonard fan Quentin Tarantino incorporated into his own writing, even before Tarantino directly adapted Leonard with "Jackie Brown." It had my favorite guest performance/character to date with Alan Ruck(**) as Rolly. In "Riverbrook," I got frustrated whenever we cut away from Raylan and back to the bank robber and his motley crew; here, Ruck was as much fun to watch as Tim Olyphant. And Clarence Williams III (who played one of the bad guys in the film version of Leonard's "52 Pick-Up") was amusingly cranky - and racist and sexist and unapologetically offensive in just about every way - as the guy who swapped cars with Rolly. (**) And even though it's been nearly 25 years since "Ferris Bueller's Day Off," as soon as Rolly sacrificed himself to the sniper's bullet, I said to myself, "He's not dying; he just can't think of anything good to do." "Long in the Tooth" wasn't perfect. The episode introduced the idea of Raylan having to sit back and let Rachel take lead, then abruptly dropped it halfway through so Raylan could be solo and have his duel in the sun. Raylan having to suppress his innate Raylan-ness for the sake of a higher-ranking, equally competent Marshal actually sounds like a fun idea (albeit the sort of thing that probably plays better as a change-of-pace episode for season two or three), but you either follow through with it and give it a payoff, or you don't do it. But it was still quite a lot of fun, extremely compelling and hopefully a signpost towards more good things to come. Really liked Alan Ruck's character and his performance too, the rest of this episode was pretty bland for me though. It's only the fourth episode but they already seem to be leaning on this bad guys with secrets (at least there wasn't a 3rd love triangle), inevitable showdowns with Raylan shooting people casually, and in the end all the bad guys die. I wish this show was a serialized version of the pilot. As a procedural I'm not enjoying it much. The second half of the season reportedly will feature the return and emergence of the Walton Goggins character, so hopefully it becomes more serialized then. I'm banking on that to keep my interest in the long term. I was under the false impression that the captivating Walton Goggins (who forever has my loyalty thanks to The Shield) was going to be the main villain for at least this season. Though I am sure he will be back before it ends, the 2nd and 3rd episodes failed to strike a heavy chord with me and left me disappointed. I wasn't sure if it would hold my interest until he's returned, as the only characters that really kept me wanting more were those portrayed by Goggins and Olyphant. This episode, however, proved itself to me just how much fun the show could be in a case of the week episode. It helped that I'm as loyal to Alan Ruck as I am Goggins. Like Abe, I would much prefer this show to take on a more serialized form as opposed to standard cases of the week. (I thought The Shield was great at blending both, maybe this could start, too) But, it was a nice return to almost form. I will continue to set myself a reminder to watch every Tuesday night. Aren't there enough serialized shows out there? I think what makes the show distinctive is how heavily dependent it is on guest stars carrying so many scenes (without the presence of any regular cast members). Kind of reminds of, believe it or not, the Love Boat or Fantasy Island in that respect. Can anyone think of a more recent show where guest stars were so prominent? Not enough that catch my interest. I'm willing to wager there are more week to week shows than there are shows where each week matters. After so many years of watching TV, I just grew tired of filler. That isn't to say that serialized shows are the only way to go, as there have been quite a few that grew tiring as well. (Lost comes to mind, after 3 seasons I just decided to wait till it's ended, and if I heard it ended well, I'd catch myself up.) I guess I was mostly just hoping for more Walton. I really enjoyed this episode. I like that they show Raylan's humanity right along with his nonchalance at taking the necessary shot. I don't like cartoon/grotesque violence, but sometimes there is nothing more satisfying like just watching the bad guy get his due. It is, after all, make believe. Two quips with the ep--as mentioned, Raylan's equally capable partner should have been shown as that & given her chance to shine. That felt like a lost opportunity. And second, and yes petty, maybe after tracking a fugitive through the desert & fighting off a sniper Raylan's hair & bangs need not be so perfectly styled. I was mesmerized by his bangs & it was weirdly distracting. (Like I said, petty, I know). Alan Ruck and Clarence Williams III. Cool. I thought I recognized both but couldn't put names to the faces. I will keep watching because Olyphant is a cutie. I like Rachel too. It's nice to see a beautiful black woman who does not look like a pretty white woman dipped in chocolate or honey. I like the Rachel character, too, that she is competent and serious. No excess "sass" or head-wagging or stereotypical stuff. It's not Breaking Bad but it's entertaining. Love Alan Ruck! I've had the pleasure of meeting him in person and he's a great guy in real life. And a great actor as well. I liked this episode much better than the last one, but I am worried about it becoming the "kill of the week" show. Hopefully getting Walton Goggins back in there will change the dynamics. u people do realize that the shield wasnt serialized at the start either right? Honestly, I'm just expecting a shoot-em up wise cracking show but if they want to deliver the drama I'm all for it. I'm a fan of the lead actor and the supporting cast is on par. The trick is to have lots of unique genuine character traits with each individual. Add the action and wit then you've got an enjoyable 45 minutes of tv. I also wish that the show was a bit more serialized - I had gotten the impression (I don't know from where) that it was going to be a seralized story, and maybe that is an element that will be picked back up later in the season. But one way or another, I really like it and will keep watching, whether it goes the procedural or serialized or hybrid route. Olyphant RULES, I've been a fan of his ever since Go. The show is clever and funny and interesting. If it keeps up this pace, Raylan will have a body count that will give Sonny Crockett a run for his money. I'm with everyone else on hoping for more serialization, but I don't mind the case of the week that much. I think there's a balance that the writers will hopefully figure out. Raylan is a great character, but he'll become stale quick if each of these episodes follow the same basic premise. I think there's a lot that could be done with the Walton Groggins character, but also with Raylan's dad (in the pilot, they implied a tense relationship and also that his dad's a criminal). Overall, I loved this episode. My biggest problem was the green screen work. There were several scenes that involved extended dialogue in the car, and the background was *extremely* distracting. Makes the show look really low budget. Also, they used that one house in LA that is seems likes it been in everything (off the top of my head Point Break and Training Day). Agreed on the bad green screen -- even Two and a Half Men does it better. Totally agree with Anonymous "The trick is to have lots of unique genuine character traits with each individual. Add the action and wit then you've got an enjoyable 45 minutes of tv." Self-contained episodes are fine with me. I get to meet some new people every week, and if they're as interesting as they have been in the first four episodes, I say keep 'em coming. It saves me from thinking ahead to what might happen next week. Fienberg and I talk a bit about the serialization question in this week's podcast (see link in the post above this one). I love this show. Alan Ruck gave a strong performance, and Tim Olyphant is very watchable as Givens, no matter what he's doing. Only thing that made me scratch my head was the desert scene where we see the dentist and his assistant have gone through nearly all their water while Givens doesn't seem to have needed any while tracking them. But eh, small quibble. I hear the ratings have gone down, and I hope that doesn't mean a shaky future for the show. To be fair, Alan, they stole a fair amount of Rolly's origin from Harry Arno in "Pronto" which starred Raylan Givens, especially the part about Raylan losing him because he read the detainee incorrectly. Also, Arno had ties to the Miami mob, as did our friend Rolly. Still loving this show but after premiering to 4.2 million viewers, it's now down to 2.1 million. That can't be good. I am sad to hear the show is down in ratings, because I am really enjoying it. I agree with others - I would like more serialization with a few stand alone episodes here and there. Has anyone heard when FX will make a decision about renewal? Standalone or not, why not think as a procedural episode as a mini-movie. Some of the best episodes of some of the best shows are can be enjoyed without knowing the backstory of every character. We're spoiled by long serial story arcs, sure, and it's awesome that producers have come around and let that happen, but when you're sitting around in your underwear on a sick day, there's something to be said for Law and Order sort of procedural episodes. Anyway, I turned my dad onto this show, he's a big Elmore fan, and he's had no problem picking it up without watching (no DVR or on demand) the first 2 eps. Mad props to Alan Ruck. I'm surprised there wasn't a Ferris quote during the car exchange (or maybe there was but I didn't catch it). Pardon the 6th grade sense of humor, but I was sure that your lead-in would be "...just as soon as I make a fist." I really liked this episode and I think it's a good thing to have some standalone episodes now and then. It doesn't require the casual viewer to know everything that has happed. You might get yourself more viwers if there isn't too much to figure out. It's not as if there is any point to tune into LOST just about now, you would actually be lost, but a standalone allows a viewer to jump right on in. Did any else notice the mexican family paid their bill with food and treats, yet were rocking the 46flat screen television (as scene in the picture). Maybe they got it during a Black Friday sale. Like you, I thought this episode was going to give Rachel a chance to shine and tell us some really cool things about her and show us some more of what she can do. And I said to myself, "Cool! ", because I really believe it's important for this show to flesh out Raylan's 3 main colleagues for it to be as strong a series as it can be. It was a good episode (and Clarence Williams III is teh awesome! ), but the bait-and-switch with Rachel really disappointed me. I don't know if serializing the show is the answer or not though I tend to stick with them more than shows that don't have a strong running story. I tend to get bored with the formula of shows like CSI and House after a season or two. Like on House you know there is going to be some strange illness that only House can solve every week. It doesn't even matter what it is after a while. Either way, I wish the show was just a little stronger and better. I don't love it or hate it. I also thought (hoped) Goggins was going to be the main villain in a running story-line. I'm sticking with it for now but I can see getting bored with it. Surprised no comments on the homage to Midnight Run - the accountant who stole the mob's money and the two bumbling hit men, who even lifted the line "did he mention me?" after the smarter of the two was talking to The Boss. Rachel learned some things from Raylan: listen to your gut, don't take the first answer as the right one and find your own hat. All shows have fluctuating ratings; people just need to have some patience. They've already told you Walton Goggins will be back; if this renews, it's likely he'll be permanent. Sit back, relax and enjoy. What too few have mentioned is the humor in this show. To wit: Raylan is speaking to Tim about "...people are keeping something from me, makes me think they're trying to put one over on me and I don't like that..." (not exact quote, but close enough) and as he walks out of the office, all I could think is, who's going to die now? Then I was thinking about how singular his walk is--one foot directly ahead of the other--very individual. 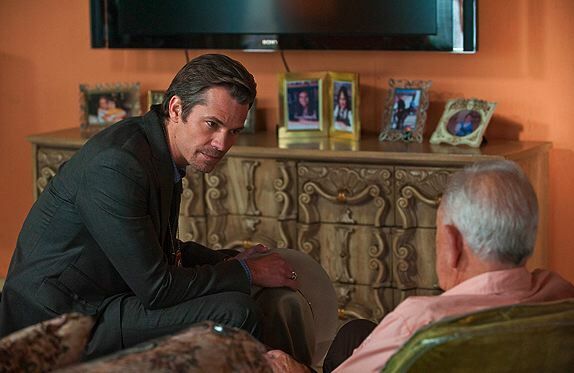 Truth to tell, Raylan is not responsible for all the deaths, just most of them. Hey, they started it. FX has earned my loyalty; who knew that Tuesdays at 10 was so much fun. Just as this goes on hiatus, SOA returns. Life is good. to Anonymous: forget the bangs; I was enjoying the unbuttoned shirt with rolled-up sleeves. Where did this guy come from?!?! Hulu finally picked up the show and I caught the pilot again. It is more serialized than I thought. In the pilot when Raylan tells his ex-wife the South America story, Roland Pike was the fugitive in the tale. Alan Ruck was terrific. He was in one of the final "Numb3rs" episodes and was very good there as well. Wish they did more with Rachel. It was fun watching her run the show until she disappeared. ooops-edit: the actors are Tim x2; the characters are Raylan and Jake. to TVG: Rachel followed the wrong path and was left out of the action. Someday she'll have the experience to truly "walk point"; for now, if she's as smart as I expect, she'd do well to listen and learn. Maybe that's why Art sent Raylan along--not only did he have a prior relationship with Rollie (Alan Ruck-great as always) but he could help her learn. She certainly was quick to give up her role when it came to dealing with (her words) the "crazy black man" but interrupted without cause. Tazel did a terrific job in a memorable L&W:SVU episode; glad to see she has landed this role. For this show, I do believe I prefer the procedural format. Lots of great/potentially great actors are most likely dancing on their agents' heads to earn a role on this show. Great stories, great cast, short time commitment and we get tons of different faces: win/win. Sheesh! Was right the first time with Raylan and Tim v. Timothy and Jacob. Hope to see more of Dewey Crowe, too. If you looked up "goober" in the dictionary, his mullet head would be staring back at you. He's somewhat thick but very loyal; who couldn't use a friend like that? This episode was Alan Ruck-ing good! I love a character who does exactly what he says he will. "Take one more step . . ." Great!